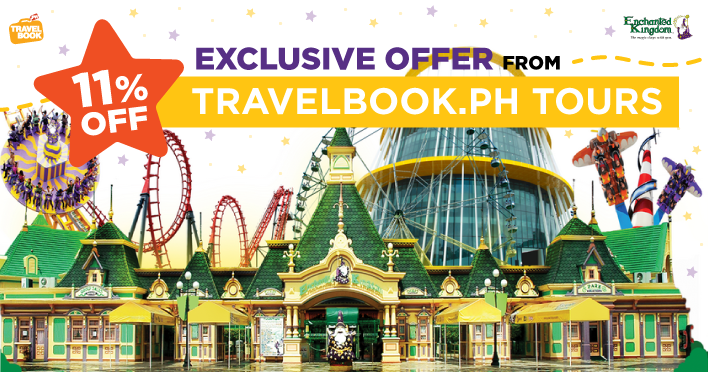 MANILA, Philippines - As an exclusive offer from TravelBook.ph, the leading online travel agency (OTA) in the Philippines, travelers can now book Enchanted Kingdom park tickets that are 11% lower than the theme park’s walk-in rates! Travelers going to Enchanted Kingdom on a weekday can enjoy ride-all-you-can passes for only PHP 536; while those taking a weekend getaway can get park tickets for only PHP 625. All rates are inclusive of VAT and service charges. Meanwhile, those who want to try Enchanted Kingdom’s newest attraction—Agila: The EKsperience can also book discounted tickets with TravelBook.ph. Travel across the Philippine archipelago in just one ride with this leisure package exclusively available in the said OTA. Agila: The EKsperience is the first and only flying theater in the Philippines that offers an innovative virtual experience to discover and explore the best of the country’s 7,641 islands. 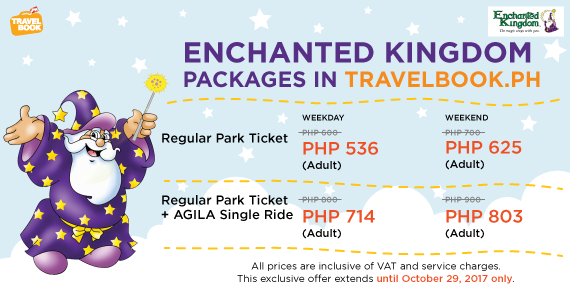 For as low as PHP 714, travelers get a single ticket to Agila: The EKsperience and a ride-all-you-can pass to Enchanted Kingdom’s rides and leisurely attractions. Those who want to bring children aged six (6) years old and below, meanwhile, may avail of this Enchanted Kingdom leisure package for only PHP 500. This weekday promo rate offered by TravelBook.ph will surely let you enjoy a hassle-free transaction as it is also already inclusive of VAT and service charge. Enchanted Kingdom describes the Agila ride as “an exhilarating multi-sensory adventure that takes park entertainment to incredible heights.” Thrill-seekers can expect to soar high and see the country’s must-visit destinations like how a powerful eagle can, in a magical experience like no other. Tick off some of the local destinations you’ve been dreaming to explore in a magical and thrilling journey when you choose to book your next Enchanted Kingdom adventure with TravelBook.ph Tours! Discounted ticket rates offered by TravelBook.ph for Enchanted Kingdom ends on October 29, 2017. As TravelBook.ph introduces their Tours platform, exciting activities like flying adventures at Trampoline Park, Manila Ocean Park escapades, and day tours at Zoobic Safari are also offered at discounted rates.